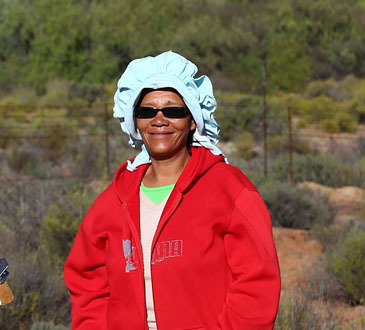 Marianna Lot has been employed in the village of Paulshoek in Namaqualand since 2014 to assist PCU researchers and post-graduate students who work in the village and surrounding commons with data collection and community liaison, and to share with them her knowledge of the area. Marianna maintains a number of long-term databases established in and around the village commons. These data sets deal with land use and sustainable development issues in the heavily utilised communal areas of Namaqualand and provide insights into the impacts of heavy grazing on biodiversity and vegetation composition. Maintenance of the long-term research project in Paulshoek remains a particular focus for the land use and sustainable development programme (one of four research programmes at the PCU) and provides opportunities for PCU students to train and contribute to our understanding of human impacts on the vegetation of the Succulent Karoo.